Good morning: it’s Hump Day, June 27, 2018, and drizzling lightly in Chicago. It will be difficult to feed the ducks in such weather, but I will do it, of course. (Note added in proof: I already have). It’s National Orange Blossom Day, and since that holiday is from Foodimentary, it probably refers to the libation (gin and orange juice) rather than to the flower. It’s also Seven Sleepers’ Day, commemorating an apocryphal story that you can read about at the link. On June 27, 1844, Joseph Smith, founder of the Mormons, was killed by a lynch mob at the Carthage, Illinois jail. His brother Hyrum was also killed. On this day in 1898, Joshua Slocum from Nova Scotia completed the first solo circumnavigation of the Earth. He was alone in the 37-foot sloop The Spray, shown below. It took him 3 years and two months, and he sailed by dead reckoning, without a chronometer. On June 27, 1954, the World Cup quarterfinal between Hungary and Brazil became violent: three players were ejected and the teams fought each other physically, continuing it after the game. You can see a video of the “Battle of Bern” (Switzerland) here. Hungary won, 4-2. On this day in 1976, the PLO hijacked Air France Flight 139 from Tel-Aviv to Paris, and forced it to land in Entebbe, Uganda with the approval of the odious dictator Idi Amn. On July 4, in a risky mission, the Israel Defense Forces secretly flew several planes of soldiers from Israel to Entebbe and, in a daring raid, rescued 103 of the 106 hostages and killed the four hijackers. It was an amazing operation—”Operation Entebbe” (run by Benjamin Netanyahu’s older brother)—and you can read about it here. On this day in 1994 in Matsumoto Japan, members of the cult Aum Shinrikyo released sarin gas, killing 7 people and injuring 660. Finally, it was on this day 11 years ago that Tony Blair resigned as Prime Minister of Britain after ten years in that position. Not many notables were born or died on June 27. Those born include Emma Goldman (1869), Helen Keller (1880), Willie Mosconi (1913), and Bob Keeshan (“Captain Kangaroo”; 1927). Those who died on this day include James Smithson (1829), the great mountaineer Hermann Buhl (1957, died in an avalanche on Bride Peak in Pakistan at age 32), and Jack Lemmon (2001). Hili: I don’t know how to say it. Hili: Could you buy a container with that sweet cream in it? Hili: Nie wiem jak to powiedzieć. Hili: Czy możesz kupić pudełko takiej słodkiej śmietanki? Honey has only eight babies; this mallard hen has 18!!!! We're also excited: it's #TapirTuesday. Tapirs love water, as these four Lowland tapirs clearly demonstrate. A camouflaged black cat. She’s there on the left! 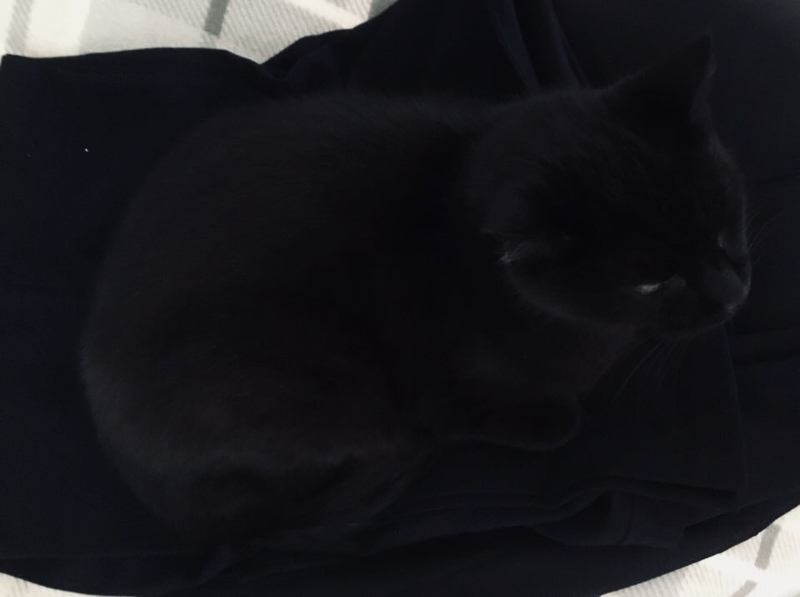 Readers Laurie and Gethyn also have a black cat: Theo (who drinks espresso) Here he is on Laurie’s dark suit. Spot the cat! Some tweets from Grania. I highlighted this one yesterday; it’s not an excerpt from this Sophisticated Theologian’s™ work, but a pronouncement. I hear tell that soon Peterson will tell us all if Islam motivates terrorism. I can’t wait for his decision. This entry was written by whyevolutionistrue and posted on June 27, 2018 at 6:30 am and filed under Hili Dialogue. Bookmark the permalink. Follow any comments here with the RSS feed for this post. Both comments and trackbacks are currently closed. Why is there what sure looks like a Union Jack flag on the bow of the Potemkin? I think it is the Naval jack of the Russian Federation. The naval ship in the picture is actually the cruiser Aurora. Potemkin was scrapped in 1923. Potemkin was significantly bigger and had much more substantial gun turrets. Followed the links to Wikipedia ,it seems amazing the Soviets scrapped it seeing their fondness for myths ,a bit like us British chopping up HMS Victory for firewood . But on the other hand The Beagle was left to rot . That’s the fate of most wooden ships, I’m afraid. the same would have happened to Victory (and nearly did on several occasions) if millions of pounds hadn’t been spent on her. Is she asking for condensed milk? That, or perhaps a container of fresh thick whipping cream. Probably both. She never tasted condensed milk. Her favorite is whipping cream and that’s what she is asking for. Literature published by AS notes that Asimov’s series depicts “an elite group of spiritually evolved scientists forced to go underground during an age of barbarism so as to prepare themselves for the moment…when they will emerge to rebuild civilization”. Joshua Slocum is one of my heroes. Sailing Alone Around the World is a wonderful book, and I have re-read it many times since I was about 14. When I took my “O” level exams (~16 years for USA readers) the paper on physical geography included a question based on a map of Slocum’s voyage. It was only a minor part of the exam, but it probably helped me to achieve a reasonable grade. That discrete foot-step illusion is the first that had me sit up and take notice, since my first convinced me that the optical system can be fooled. Sadly, the explanation was really mundane (time wise lack of motion cues; http://www.michaelbach.de/ot/mot-feetLin/index.html , https://www.ncbi.nlm.nih.gov/pmc/articles/PMC4975121/ ).